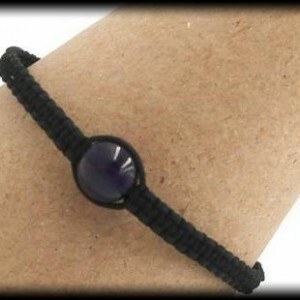 This beautiful Angelic bracelet is very strong and powerful with it's energy. The 6mm White Jade brings about harmony, luck, friendship and a feeling of peace. 8mm Angelite is a great stone to enhance your overall awareness while encouraging you to speak your truth. 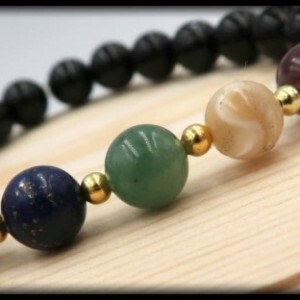 The 3mm Pyrite accents help with releasing stress and frustration in your daily live. This will be a great additional to any jewelry collection! SIZING INFORMATION Please measure your wrist with a measuring tape to ensure the most accurate measurement. If you do not have a measuring tape, you can also use a string by wrapping it around your wrist and then cutting the piece of string. After you have your cut string, place it alongside a ruler and write down your measurement. To ensure a perfect fit, please had 0.5 inch to your wrist measurement, if you want a little room please add .75 inches to your wrist measurement.